Pencils: Common in the Old West? 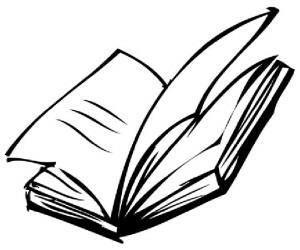 You’re reading along in a cowboy Old-West Romance… and somebody’s using a pencil to write in a journal, “pen” a letter, or make a notation in a ledger. Does it yank you out of your enjoyment to pause and wonder? 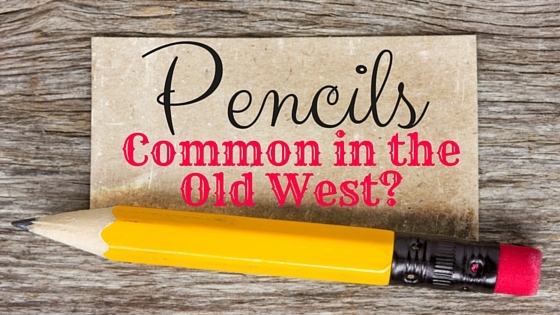 Were Pencils Common in the Old West? That doesn’t necessarily mean they were as plentiful as today, where my kitchen junk drawer holds roughly 7 thousand of them, and my the pen cup on my desk hosts another two dozen. But in the days of the Old West, pencils weren’t luxury items, either. 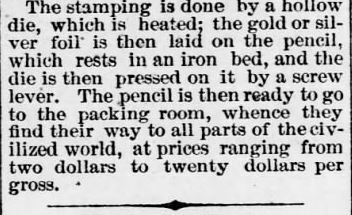 Closing paragraph of an article “How Pencils Are Made” published in The Wynadott Herald, Kansas City KS on Thursday 13 June, 1872. Image, courtesy Newspapers.com. The Wynadott Herald of Kansas City, Kansas, published an article 13 June 1872 about how “commonplace” pencils are made, concluding with the price ranging from $2.00 per gross (A gross = 144 count) [One pencils costs less than two cents] to $20.00 per gross [one pencil costs less than fourteen cents]. In many ways, pencils were much more portable than pen and ink. 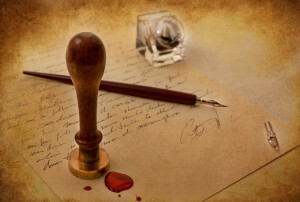 Prior to the invention and common usage of fountain pens, people literally had to have a separate bottle of ink to dip pen nubs in. Messy business, that. A significant, dense (the only of its kind, to date, in fact) natural repository of solid graphite was found at Cumbria in England in the 1500’s. 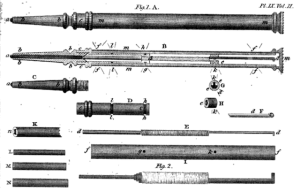 Graphite is not lead, but chemists at the time didn’t know that. 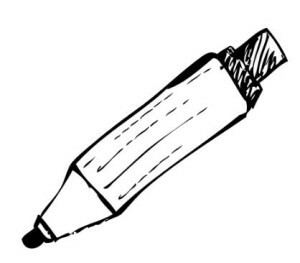 Hence the term “lead pencil”, though graphite is a form of carbon and not related. Believe it or not, people did contract lead poisoning from graphite pencils…but not because of the core. Paint used in the 19th century contained lead and those prone to chewing their pencils would ingest the lead paint, causing lead poisoning. Factories harnessed the industrial revolution machination and quickly turned the time-exhaustive work of pencil-making into a mass-production enterprise. Early and significant pencil makers in the young United States were Joseph Dixon (Dixon Ticonderoga Co.) and John Eberhard Faber (Eberhard Faber Co.). Any guesses when erasers were first attached to pencil ends? In the 1860’s and 1870’s, pencils were mass-produced in the United States, driving prices down and increasing the abundance. The first mass-produced pencils were natural and unpainted–all the better to show off the high-quality wood casings (and make it obvious premiere red cedar was used). By this time, manufacturers started imprinting brand names on pencils. One major, determined-to-be-the-best manufacturer began painting their pencils their trademark bold yellow, thus informing consumers of superior quality at first glance. It wasn’t long and imitators also painted their pencils yellow. Mechanical Pencils were a 20th Century development, though, right? And there you have it. Probably much more about the history of pencils and the probability that the literate in the Old West with simplest of means would have owned a pencil (or five), and likely used them regularly for all the reasons you and I do. Grocery lists. Letters (OK–maybe you don’t hand write letters anymore, and certainly wouldn’t in pencil if you did). Instructions. Addresses. Notes. Recipes. If paper was had. But that’s a different topic. Please, do leave a note. What do you think of this subject? 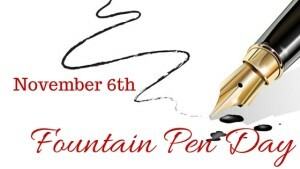 Victorian Fountain Pens The Victorian American West Paper: Common in the Old West? The little things do count. And I love when I learn something I didn’t know I needed to know for my own writing. I agree. The little things do count. Isn’t it fun learning all we can learn about the 19th Century (to ensure our own writing is accurate)?